Implants are artificial tooth roots that are fixed or implanted into the jawbone or maxillary bone, creating a solid base to attach dental prostheses which can be partial or total. The aim is to restore the function and look of the lost or damaged teeth. Implants are the best substitute for lost natural teeth because once the dental prosthesis is in place it looks and feels like a real tooth. A dental implant is a titanium structure in the shape of a screw which is fixed to the maxillary bone (where the top teeth are) or in the jawbone (where the bottom teeth are) to replace missing teeth or molars. Dental implants can be different sizes and the implants chosen will depend on the space in the mouth and the amount of available bone the patient has in the area to be treated. If the patient lost their tooth or molar many years previously,the bone goes through a process of reabsorption (bone is lost). Usually in these cases the patient does not have enough remaining bone and so other techniques will have to be used so that the dental implant can then be added to the affected area. Not all materials are the same quality or have the same benefits and this is often reflected in the price of the treatment. It is important to be fully informed before agreeing to any dental work, especially if the price is very low. Ask your dentist about the materials and techniques that your treatment will involve. Professional dentists use the best technology and the appropriate treatment for your case and will be happy to answer your questions. Bone graft procedures are used when the patient does not have enough remaining bone, usually when the bone is not wide enough. The easiest and most common way to deal with this is to use a synthetic bone graft, in powder form, added around the implant. This is done in one surgical procedure, with the implant and the bone added at the same time. A sinus lift is used when the patient’s remaining maxillary bone (the bone where the top teeth are) is not high enough. In this case a synthetic bone graft is also used and is added a few months before the implant is fitted. It is added through the gum where the implant will be installed and increases the amount of bone in the affected area. When the bone graft has merged with the patient’s bone and reached the required level of bone maturity the implant can be added. Dental implants are the ideal solution for replacing missing teeth. For a successful result, it is essential to plan the case in detail and carefully follow the steps for fitting dental implants, from the first day of treatment through to the end. 1. The first stage in the process for fitting dental implants is examination by a specialist and it is essential on this first visit that the surgeon takes a full mouth or panoramic x-ray to evaluate the condition of the bone in the areas with missing teeth. 2. After evaluating the patient’s mouth, the amount of remaining bone and the patient’s general health, the surgeon can determine if dental implant surgery is a viable option. 3. In cases where there is very limited amount of bone, a CAT scan will be taken to confirm whether the dental implant is viable. 4. On this first visit, each step in the dental implant process will be explained to the patient. 1. If the patient needs other antibacterial treatments such as professional cleaning, gum treatments, removal of teeth that cannot be repaired, removal of decay and so on, these must be carried out before continuing with dental implants as the presence of excess bacteria or infections in the mouth can interfere with the success of the dental implant treatment. 2. Once the mouth is healthy, surgery to fit the dental implants can begin. -The area to be treated is anaesthetised. -The bone is prepared for the dental implant by using a succession of drills in the same shape as the implant, starting with a small drill and gradually getting bigger until the exact space for the implant is created. 1. Follow-up a week after surgery, to remove sutures and assess the implant. Once the dentist is happy that the patient is ready for the next stage, the patient returns to the dental clinic in Barcelona to have the prosthesis attached to the implant. The prosthesis is the artificial tooth or molar. Moulds are taken for the prosthesis. This mould is sent to the laboratory to create the teeth that will be attached to the implants. Tests on the internal structure of the dental prosthesis on the implant. X-ray to check that the prosthesis and the implant fit together correctly. The artificial tooth is fixed onto the implant. X-rays are taken to confirm it fits correctly. The screw-access hole (where the screw that is used to join the prosthesis to the dental implant goes) is sealed. The patient leaves this visit with their finished teeth. If the steps for adding dental implants are followed correctly the chances of successful treatment are very high. Once the implants have been put in place, the prosthesis that will replace the dental crown is added. There are several ways of doing this and it can be done at different moments during the treatment. If the patient wants fixed teeth in one (1) day, the provisional prosthesis will be done in the first 24 hours after placing the implants. If the patient is not a candidate for fixed teeth in one (1) day, they will be given a removable provisional prosthesis and the definitive fixed prosthesis on implants will be added after a few months. The main aim of dental implants is to restore lost teeth. This means that there is no point in dental implants if the prosthesis is not correct as this is the most important part of the process. Before creating dental implants, it is important to plan the prosthesis that will be used with the implants as this will determine location and direction of the implants. 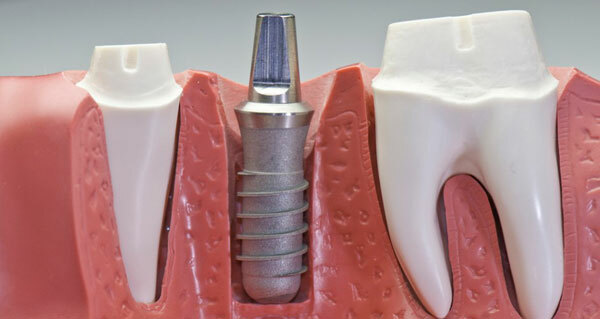 A one-piece prosthesis is screwed to a single dental implant to replace a single missing tooth. These prostheses are usually placed between two natural teeth although on occasions two one-piece dental implants can be placed together. This type of prosthesis usually replaces between three and five missing teeth. The crowns that make up this bridge are usually screwed to two or three dental implants. Full dentures are used for patients who are completely edentulous, that is to say who have no teeth at all on one or both of the dental arches. These dentures are usually called implant-supported dentures or implant-supported overdentures They are usually made up of between 10 and 14 teeth and are screwed to several dental implants simultaneously. In some cases where a great deal of bony rim has been lost and only a couple of implants can be added, the prosthesis will be removable. Removable prostheses on dental implants have an advantage over conventional removable prostheses in that they are fixed to the implants and do not move when chewing or speaking and so on. One-piece prosthesis and bridges on implants can be made from the same materials used for crowns on teeth, for example metal-porcelain crowns or zirconia-porcelain crowns. Usually this type prosthesis needs between two and three visits to be fitted definitively in the patient’s mouth. One visit to take a mould that can be used to make a made-to-measure prosthesis, a second visit for tests and fittings and a third visit to have the prosthesis fitted in the mouth. Detailed planning and the selection of appropriate material for the prosthesis will help to ensure treatment’s long-term success. The success of dental implants depends on the bone they are implanted on and that is why after x-ray by the surgeon in Barcelona it is necessary to decide if there is enough bone to integrate the implant into or if it will be necessary to use a bone graft for the dental implants to ensure correct osseointegration. When there is not enough bone structure, there are a variety of bone graft options for dental implants; the following is a description of the most successful and commonly used techniques for dental implant surgery in Barcelona. Nowadays, most dental implant surgeons in Barcelona use synthetic bone grafts. With this type of bone graft, the patient must not be given other additional treatments to ensure the regeneration of their natural bone. This type of bone graft is usually used when the patient needs to increase the width of the bone. To get an optimal look and ensure the dental implants work correctly, they must be completely covered by bone and this is why synthetic bone in powder form is added around the implant in areas where the bone is very narrow, and the implant screw is left partly uncovered. It is very safe and totally biocompatible with the body meaning the success of this treatment is assured provided there are no other factors affecting bone regeneration. As well as synthetic bone, the process of bone regeneration can benefit from the application of membranes that guide the bone growth needed. These membranes are reabsorbable and also very safe and biocompatible. Although the use of these techniques can slightly increase the cost of dental implant treatment in Barcelona, there is no doubt that they are necessary, using them ensures the success of dental implant treatment. This procedure is used on the upper arch when the patient does not have enough bone height and ensures the stability of the dental implants. It also uses synthetic bone in conjunction with a reabsorbable membrane. The advantage of adding the maxillary sinus lift and adding bone graft for dental implants, is that it allows dental implants to be fitted in areas where it would previously have been impossible. Crowns on dental implants are used to replace individual missing teeth. When this type of prosthesis is used on implants, a crown is fitted for each dental implant in the mouth, so if three teeth are missing, three dental implants are fitted with a crown on each implant.. 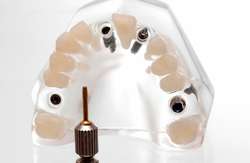 When the prosthesis on the implant is a one-piece prosthesis, the crown can be screwed directly into the implant or can be a porcelain crown, cemented on a base screwed into the implant. This is the most commonly used type of prosthesis on implant. This type of crown can be adjusted over the years, for example if the crown on the dental implant works loose, only one visit to a dental implant specialist will be necessary. The dentist will expose the screw that has become loose, adjust it and seal the tooth. This type of prosthesis is usually only used when the look of the teeth would be affected by a screw-retained crown and is generally fixed at the back. Cement-retained crowns on dental implants have certain limitations with regards to long-term term fitting. When the porcelain crowns are cemented to a screwed base, it will be necessary to remove the cemented crown in order to access the screw and in some cases, it will need to be cut, meaning a new crown will have to be made. Metal porcelain crowns are usually used on posterior/back teeth. There is a range of very sophisticated techniques which give highly attractive results around the neck of the crown, ensuring that the metal is not visible when the gum moves and the base of the crown is not visible. Zirconia porcelain crowns are usually recommended for anterior/front teeth. These crowns with a zirconia base give a very natural result as the white colour underneath the porcelain adds a translucency that is similar to a natural tooth, whereas crowns with a metal base can give the tooth a greyish hue. Both types of crowns and both materials fulfil the main objective, to replace the missing tooth. What types of dental implants exist? Implants have been developed in various forms and different types, always seeking a fast, intense and stable bone to bone union over time. In this scientific development, different materials have also been studied, and today we have come to the conclusion that the best material for the manufacture of implants is titanium (pure or in alloy), since it is considered the most biocompatible metal that exists with human bone. Smooth: With or without surface treatment. Screw form: With or without surface treatment. LAYER: With or without surface treatment. Metallic: With or without surface treatment. Dental implants without surgery: What do they consist of? A three-dimensional scanner can be used to make a planning that allows us to place the implants virtually in the computer. 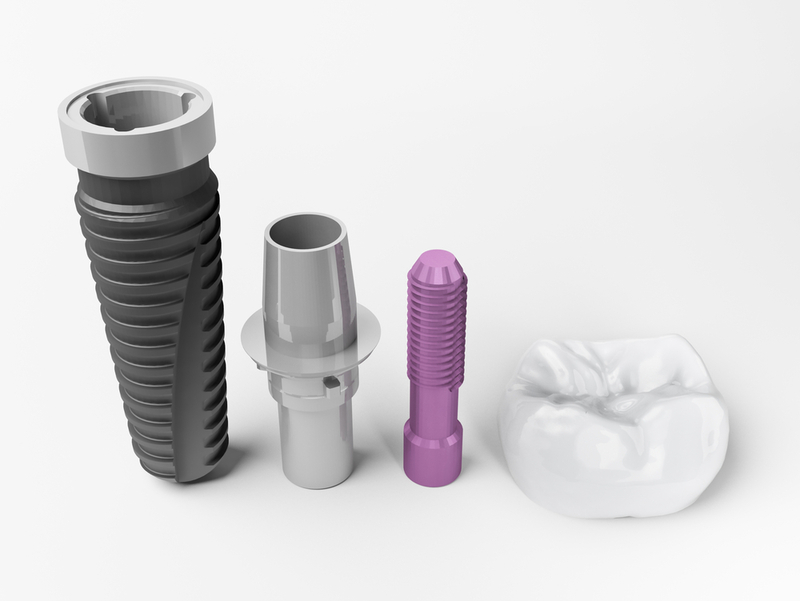 With this planning, an individualized splint or template is created that is used as a surgical guide for the placement of the implants without the need to open the gum in the previously planned position. Does it hurt putting a dental implant? While any given type of dental surgery can cause some discomfort, patients usually find that the pain from the implants is minimal, and the results are well worth the recovery process. Implant placement usually causes very little discomfort. Local or general anesthesia and sedation are commonly given to help reduce discomfort during the procedure. Most patients report that the implant placement procedure is much more comfortable than they anticipated. Your doctor will prescribe medication to relieve any discomfort that may occur after the treatment. If you are concerned about discomfort during the procedure itself, ask your dentist to recommend another patient who has already had dental implant therapy to evaluate their personal experience. Is there risk of rejection with a dental implant? The patient should always follow the advice of a dental professional to evaluate whether implants are the optimal solution for them. The risks associated with the inclusion of a dental implant may occur due to poor oral hygiene, an unfavorable bone pattern, or the presence of pre-existing conditions (e.g., diabetes and osteoporosis). These factors depend on the medical or other individual conditions of each patient. Although they do exist, complications are rare, and when they do occur – they are usually mild and easy to treat. Often, the site can wait for it to heal for a few months and the implant is successfully reinserted. How long do natural teeth last? They must last a lifetime. However, we are all familiar with examples of teeth that have not served a person’s life. Inadequate dental care or lack of treatment when necessary are the most common reasons for dental problems. The same is true for implants. With routine dental care and check-ups, implants should last a lifetime. No one can guarantee that, because a person’s health depends on many factors that are beyond the dentist’s control, for example, meeting basic nutritional needs, proper hygiene, genetics, disease processes that might occur. Therefore, the answer to this question really is that no one knows how long each implant will last. Success can be influenced by the after-care and dentist quality you have chosen for your implants. All this may tip the balance in their favour. How long does it take to have a dental implant finished? After placing the dental implant, which is performed in the first session, a follow-up visit should be made one week after the dental implant placement surgery to remove the stitches and assess the progress of healing. From this point on, it is necessary to wait about 5 to 6 months to see if the dental implant has been placed in the upper jaw and about 3 to 4 months if it has been placed in the lower jaw. This period of time is necessary for the osseointegration of the dental implant into the bone. Once the dental implant has been osseointegrated, the dental prosthesis is performed on the implant. This procedure usually lasts about 3 more weeks. After finishing the prosthesis on the dental implant, the procedure is finished. Subsequently, it is recommended to perform semi-annual check-ups, as they should be done in the case of natural teeth, for the correct maintenance of the dental implant. If there is little bone, is it possible to place dental implants? In this case, the implantologist will evaluate the possible bone regeneration. The bone regeneration procedure consists of filling the area of bone loss with artificial bone so that natural bone forms around the dental implant from the artificial bone and is osseointegrated. Do you have to quit smoking in order to have dental implants placed? The ideal is to stop smoking permanently, but if this is not the case, it is recommended not to smoke anything during the first week of implant placement, as tobacco, being a vasoconstrictor, is involved in bone recovery and healing. Once the week is over, you can resume smoking, smoking a maximum of 10 cigarettes a day.